Latino Art Beat President Don Rossi Nuccio attended the 34th Annual Chicago Latino Film Festival recently where filmmaker and former Chicagoan, Yelyna De Leon writer, along with Luis Iga, director and producer premiered their first feature length slasher film, “Murder in the Woods” starring Danny Trejo. 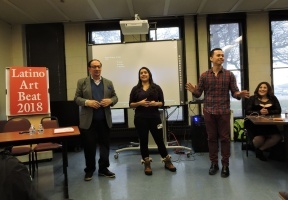 In an effort to celebrate Latinos in Film, Rossi Nuccio arranged for a presentation at Curie Metropolitan High School in Chicago’s southwest-side to an audience of nearly 200 enthusiastic young students interested in film and the arts. In addition to the producers, two of the films actors; Kade Wise (EMPIRE) and Chelsea Rendon (VIDA) were present for the question portion. 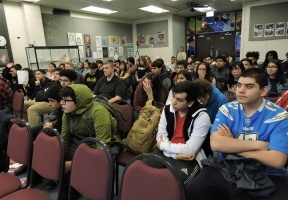 Latino Art Beat has had collaboration with Curie for at least 15 years during which time over $500,000 has been awarded to the talented young Curie participants of its annual visual arts competition themed, “What Hispanic Heritage and Culture Means to Me?” For more information on Latino Art Beats, visit www.latinoartbeat.com.